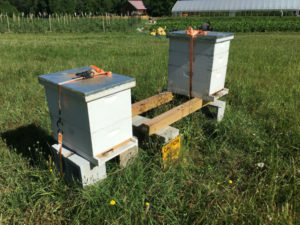 One of the things visitors to Gate City Harvest Farm will notice is the row of bee hives in the field across from the farm stand. This is our Lazy Creek Apiary and is currently home to some 300,000 honey bees. Throughout the year, this number will grow to at least twice that many bees and they are all doing their part to bring the best produce to Gate City Harvest Farm. The cucumbers, squash, and melons in particular rely on the honeybees for pollination. A cucumber requires a honeybee to visit its flower multiple times over a short time period in order to get a pretty cucumber. In addition to the fully formed vegetable, the honey bees also provide enough pollination services to increase the crop yield. Farmers have seen up to 30% increase in their yield by including honey bees on their farms. Keeping honey bees healthy is a full time job and requires regular monitoring and intervention from a beekeeper. Honey bees can forage for food up to 1 ½ miles from their hive, so we can’t control everything they are exposed to, but at Gate City Harvest Farm, they are not exposed to chemicals and we are continuing to plant to increase their foraging areas. Starting this summer, all of our queens will have genetic traits to help the bees manage the single biggest problem for honey bees in this country – the varroa mite. This makes a big difference in how often and what method we use to help control the mites in the hives. 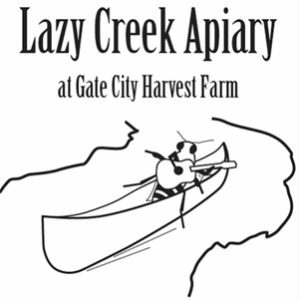 Lazy Creek Apiary only uses natural products in managing the colonies, following the guidelines of the Certified Naturally Grown Apiary standards. North Carolina generally has 2 major nectar flows during the year – spring and fall. With the loss of a lot of the natural foraging lands around the city and unpredictable weather that affects when and how much nectar is available, our bees can’t always make enough honey to sustain their hive and provide extra for us. Our bee’s health comes first, so we always leave them with a lot of honey before taking any for ourselves or for sale. If we do have honey for sale, it will be available in late summer or early fall at the farm stand.